Airtel, the leading Telecommunications brand in India recently launched 4G services. There are so many positive reviews about it in the Media and many of my friends have already switched to it. This built excitement in me and I wanted to test the speed of their latest launch in numbers. Almost all of us use apps on our phones and Airtel has introduced a great initiative, wherein users can ask for speed comparison between 2G, 3G and 4G network. I use Flipkart a lot and they are planning to app-only soon, so I wanted to check how much time it will take to download this app on my smartphone. 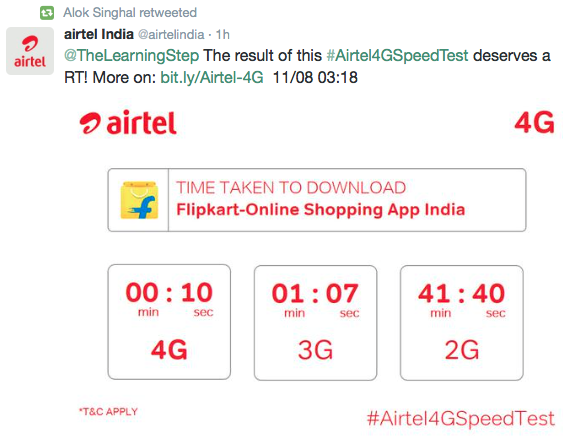 I was pleasantly surprised to see a response from @AirtelIndia in just a few seconds with an info-graphic showing the comparison between 2G, 3G and 4G download speed for Flipkart app. The result for 4G speed is simply amazing. There is nearly a minute difference compared to 3G network, and 2G would have put me to sleep anyway. Just 10 seconds to download an app – that’s blazing fast by any standards. Generally it takes nearly a minute to download an app even on the fastest on networks that I have used in India. The snapshot Airtel tweeted me has prompted me also to switch to them. 1. 4G is available at the 3G price. 2. If our network is faster than theirs, they will pay our mobile bills for life. 3. They will deliver the 4G SIM for free at our doorstep upon request. 4. In order to start with 4G, following snapshot comes in hand. Still waiting? Just tweet and get started! Nice! I get 2G and nearly no phone signal at home. The joys of living in a small village! Sounds very nice Alok. I am an Airtel 3G user and after reading this post I am going to them and getting upgraded. Thanks for info. Just what I wanted. Yes, you won’t have to spend extra as well. 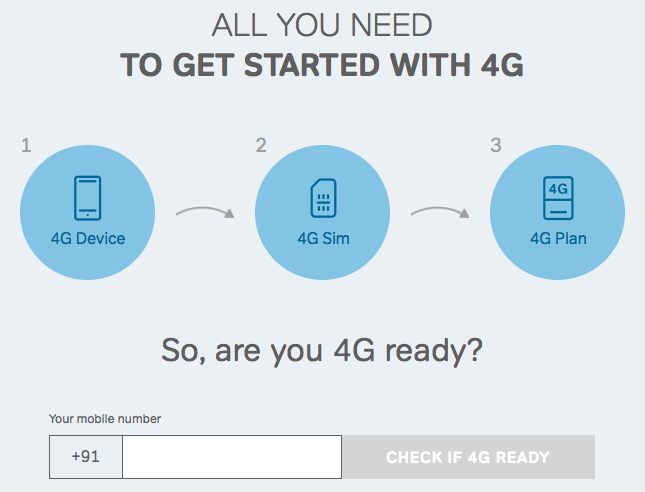 Just ask for 4G SIM via their website and they will deliver free to your home. You are welcome, brother. There is benefit in upgrading. Airtel has made it as easy as it can be for the customer. Must say it is a smart strategy. Hope the speed is always just as fast. I loved their strategy of keeping the same price and delivering SIM free of cost. And, they are going hi-tech too. informative! i have been pondering too…to switch or not to switch.. Try switching, i don’t think you will be disappointed. Truth is, I’m using Airtel 4G and it’s slower than my Vodafone 3G. I get about 5 Mbps in speed tests. I dunno if it’s a problem with my location or anything. Thanks for the info, Alok; I already am an Airtel 3G user, and presently my number is kept in safe custody, as I am out of India till end October. The speed you are talking about is a strong prompt to upgrade; will do so on my return. I am sure you will enjoy the upgrade. Thank you for inputs. Wow, that’s pretty fast. I think Airtel is going great guns! I’ve used airtel since forever. But now I’m gonna switch to Vodafone. The call drop issue is too much a headache to bear!! Hope airtel improves its basic services first, rather than introducing new ones. That’s a good point and i appreciate your inputs. Hope they will take it seriously! I hope so too!! Everybody in my family uses airtel. But I just lost my patience with it, hence switching to Voda. They don’t have enough towers. I need to drop in a word of caution here though. Airtel was the first company to have introduced the “Internet Disparity” by affecting the Net Neutrality for bloggers like us. As a part of their strategy, they have compelled the DoT and the Govt against net neutrality issues and soon intends to get into a monopoly market mode. Which means things will now become like “Tata Sky ala-carte packs”, in which normal users like us will have to pay heavier prices for accessing essential websites. Only the pricey websites get featured more and the low cost businesses die their own deaths. Although the 3G to 4G will be an easier conversion at start, but there are prices to pay ahead. I hope we are able to look into what Airtel is upto…. Absolutely agree. I think Govt has to take appropriate steps, else we all will have to pay. Appreciate you adding a word of caution here. Thank you so much, Rajat. I hope we catch up during my lifetime! Hahaha, I think no way we can keep up with changing technology. Did a similar one with Twitter app. Thank you so much for inviting me. However, I am currently traveling and won’t be able to take part. I hope it is ok with you. India need a high speed mobile network, hope Airtel 4G could be that one. I hope so too, they are not doing so well yet though.